Today I would like to write few words about my without doubt favorite Carcassonne version. This was the first in the "Around the world series". It is very unique considering graphical theme and above all rules of the game play in general. 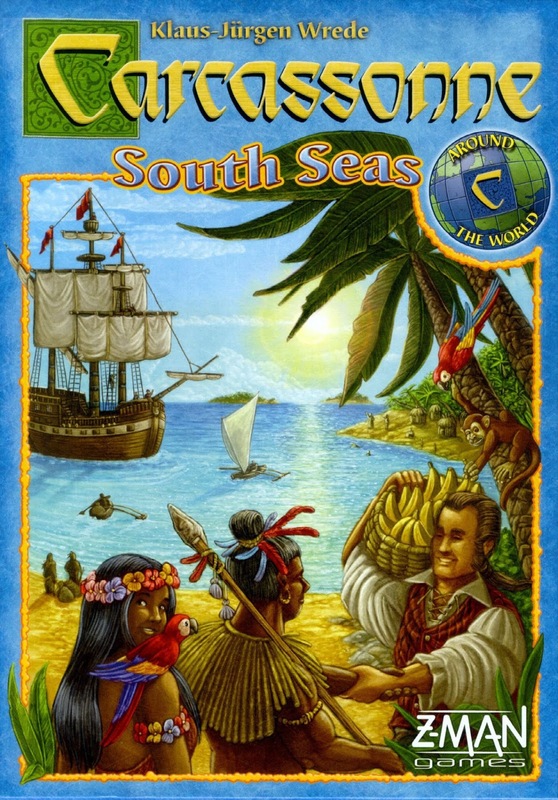 What makes South Seas spin-off so special? Well, playing it is like eating bananas in the sun while watching sea waves slowly approaching the golden sand. It is relaxing. Say good bye to stealing, blocking and huge overcrowded cities. If farming rules overwhelm you or your friends, you can forget about those too. The theme circles around being an South Sea islanders, who gather bananas, fishes and seashels which than can then be sold to passing ships. After opening the box and taking the first glimpse, you may feel confused. While there is a lot of additional wooden components beyond almost standard meeples, there is no score board. It's absence will be discussed in additional rules section. I like the blueish look of the game, it stands out nicely from the more usual green. The tiles are played out one by one in usual manner. Instead of cities we have island. Roads are replaced by bridges, while cloisters have changed into markets. Each player is provided with just four meeples. This is not much, but every time player do not play a meeple and have no meeples in his supply he may remove any one of his meeple from the board. There is no direct scoring after completing the feature. Instead, players receive resources (bananas, sea shells or fishes). At the end of each player turn he can replace his resources for one ship from the pool of four. There are 24 ships all together, their score varies from 2 to 6, depending on how many wares are required to get them. After the exchange, the pool of available ships is replenished up to four. In some cases it is not required to sell particular type of ware. Sea Regions are the most unique, in that you can trigger an evaluation in two ways: either by completely enclosing it or by placing a tile depicting a fishing boat in the area. 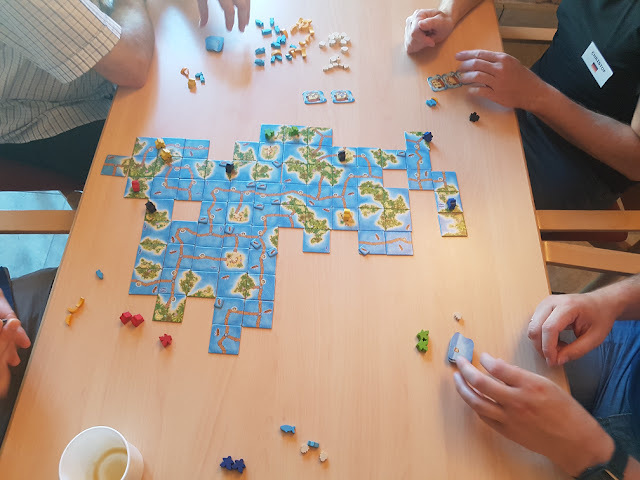 In the latter case, the player who triggered the evaluation covers one group of fish in the region with a fishing boat token, after awarding the appropriate amount of fish to the occupying fisherman. Thus, an open sea region can become overfished as it is occupied, scored, depleted (one fish group covered with a fishing boat), then occupied again... It’s a neat new mechanism. Diversification has never been so important. Now it is not only about increasing chances of drawing tile that fits your projects. Each ship requires various resources, so it is crucial to complete different features. Game is less competitive. There is considerable less stealing and blocking. Everyone is forced for quick scoring, since you do not have much meeples and those ships are not going to wait forever. Islands are usually small and you do not get any points at the end for not completed features. Islands are no longer best way to score points (comparing to cities) and over stocking with bananas does not help with anything. A with most of the spin-offs, the publisher tries to address the wider audience than the original Carcassonne. It is easier for kids without long term farms investments and complex maths. Lack of score board is the main point that makes the game relaxing and less competitive for me. Unless you memorize the cumulative points of acquired ships for each player, there is seldom an obvious leader or looser at any point until the final scoring, since you cannot judge who is the winner at any points just by the number of ships in his stack. A I said in the beginning this is my favorite Carcassonne spin-off. This is the biggest revolution in Carcassonne mechanics up to this date, a great refreshment and a must buy for all Carcassonne fans that look for some refreshment from usual Carcassonne approach.